Whether you’re training in summer heat, attempting to keep up your exercise routine while on holiday, or wondering how on earth athletes will bear up during the Rio Olympics, exercising in heat needs to be carefully considered, because it can actually improve your performance, as long as the right precautions are taken. 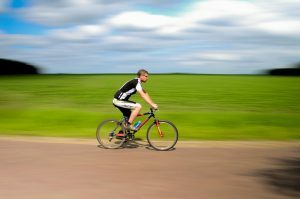 Researchers from the University of Oregon found that when comparing cyclists training in heat to those at a more comfortable temperature, the group in heat improved their performance by 7%. What really surprised the researchers was that not only did the group seem to acclimatise to heat, but also perform better in cooler conditions too. And this happened over the course of just 10 days. That’s not to say all training should happen under the sizzling sun, but if you are exercising in hotter conditions, there are some important factors to consider. Water regulates your body temperature and transports nutrients around the body. When you don’t replenish your fluids, your heart finds it harder to circulate blood and that could lead muscle cramps, dizziness, fatigue, heat stroke, and heat exhaustion. But also remember that staying hydrated has a small effect on your body temperature. The best way to stay cool is to slow down, listen to your body and don’t over do it. Your body doesn’t just lose water in sweat, it also loses important electrolytes like sodium. Losing too much sodium can become a problem, especially if you’re a salty sweater. (if you want to find out if you’re one of them, check out this salty sweating guide). If you are, increase the intake of salty foods like peanuts, crackers and seasoning on your food, but of course avoid processed foods that are high in salt. And don’t fear adding salt to your water or sports drink. You can add up to ½ teaspoon of salt to 900ml without it leaving a bad taste in your mouth. You’re not going to beat your personal best when training in heat. But don’t be discouraged. Instead of focusing on timings and speed, focus on the feedback from your body and the amount of effort you’re putting in. Avoid normal clothing such as cotton that keeps moisture in and instead invest in technical sports clothing that wicks moisture away from your skin. The fitter you are, the better your body will deal with the heat so build your fitness to a high standard before you train in higher temperatures. On the first day in heat, take it slow and steady and build from there.